How would you feel if you realized you had directly misled the entire world as to the location of the Pyramids? My mistake wasn't quite that serious, but I take responsibility for accidentally hiding one of China's emerging tourist attractions from the entire world. In Part One of our story, I wrote that I received an upsetting note from a Korean man named Suhan. This gentleman correctly pointed out I had badly misplaced the true location Guoliang. I was grateful that Suhan was willing to take the time to steer me in the right direction, but I was at the same time I was deeply embarrassed at my mistake. Immediately after receiving this note (October 2009), I went back to the Internet to double-check the location of Guoliangcun. The first thing I discovered is that there is still a lot of confusion on the Internet about this place and other exotic locations such as China's Huashan (a favorite topic of mine). For example, I noticed one website placed China's Mt Huashan over in Tibet. "The most dangerous tourist route in the world is located in Tibet." That made me feel a little better. At least I got the country right when I made my mistake on Guoliang Village. As for the Tibet nonsense, fortunately there were many comments listed directly below the picture that corrected that website's mistake immediately. These pictures are not in Tibet! This is Huashan near Xian. Thousands of people have climbed these mountains and only a few sections involve chains and footholds (other routes avoid these). There is no significant danger here - it is all in the mind. You should give it a go, it is character building. No that isn't Tibet! That is Hua Mountain in Shaanxi China! I have been there! I have frequent dreams of being stuck on a mountain path almost exactly like this one. Needless to say, they are not pleasant dreams. I am glad that this trail is available for people who want to climb it. But, have to be completely insane to do it. Sorry. It's just the truth. Awesome pictures, have always loved to participate in these adventurous tours but my wife wont let me into this. Anyways the temptation is too good to resist and I will definitely figure out ways to escape her and join in one such expedition. The conventional travel where we relax on a Holiday home is so boring for me its time for some real action. I'm training for this wonderful trail and plan to be playing chess on the East Peak within five years. Not that hard. Just don't mess up. It's Yellow Mountain in China, just near my hometown. I've been there quite a lot of times. It's really amazing! This climb is known as the most dangerous tourist route in the world, its on Mt Huashan located just outside of Xian in China (NOT Tibet!). I did this in May 2008. 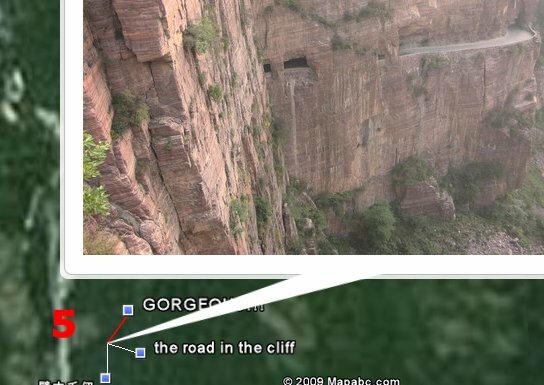 I have also been along the most dangerous road in China known as Precipice Long Corridor. This is located in Guoliangcun. I also did this in May 2008. Finally I have also cycled the most dangerous road in the world known as the Yungas Road located in Bolivia. I did this in August 2008. None of these places exist in Tibet! Hope this settles any confusion. I Lost It, Now I Better Find It! My own mistake was not quite as serious as placing Huashan a thousand miles away in Tibet. After all, Hunan Province and Henan Province are only about 200 miles apart. 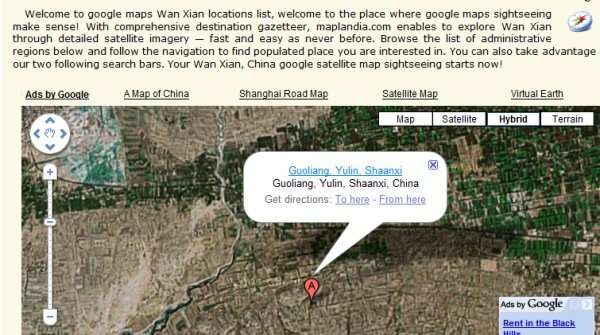 Nevertheless, I was still upset to discover that I had PERSONALLY contributed to world-wide confusion over the exact location of Guoliang Village. You probably think I exaggerate the importance of my mistake. In truth, I honestly believe I was the MAIN REASON that the correct location of Guoliang had literally disappeared off the face of the Internet! As you read this story, you will see that I write a compelling argument to support my suggestion that I was the single person most responsible for losing Guoliang to countless Internet users FOR TWO AND A HALF YEARS! I've read your site with great interest as I wanted to travel to Mt. HuaShan. It's definitely a great mountain, and after my travels, I can attest that it's not as dangerous as your main article suggests. But I'm sure you've already received a lot of correspondence regarding the mountain. I'm actually emailing you about some inconsistencies regarding your article about Guoliang Tunnel. I'm a Korean studying Mandarin in Beijing, and was looking for other sites to travel to in China. 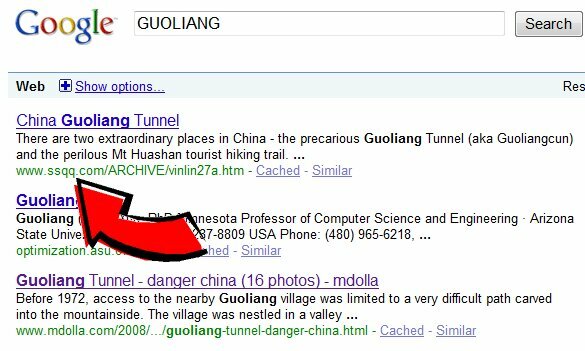 Of course, I wanted to check out Guoliang tunnel, but wasn't able to find it. It turns out that the tunnel is actually in Henan Province, which is a different province from Hunan (??) as mentioned in your article. Hunan is more famous for being the province that Mao Zedong was born in. Also, your map that shows the location of Guoliangcun is totally wrong too. You actually marked the star some place in the Hebei province, though the location of Huashan is correct. I know this won't be a high priority for you, but it would be great if you took the time to correct these inaccuracies when possible. It would be so kind if you could identify the exact location on a map. On Tuesday, October 13, 2009, the day after I received Suhan's letter, I decided the responsible thing to do was find the correct location and correct my mistake. The first thing I did was to review my original 2007 article. That is when I realized I had inadvertently copied someone else's mistake. 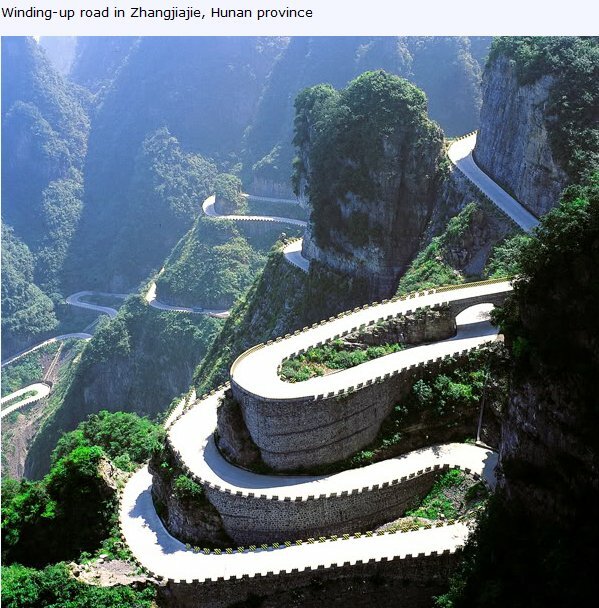 The mystery pictures of the Yungas Road in Bolivia were actually from the Guoliang Tunnel Road in Hunan Province, China." Okay, so I made a mistake. Two years ago I naively took someone else's word for it and got burned. How hard can it be to fix it? I will locate Guoliang and fix my map. How long will that take, 5 minutes? Guess what? I expected the search to take 5 minutes. It took me five days! I kid you not. It took me three consecutive afternoons to track down the real Guoliang and two more to write this 2009 story. I began my search for Guoliang by returning to my friend, the Google Search Engine. I typed "Guoliang" into Google. Not surprisingly, I got all sorts of hits. I noticed my own web site was listed first. There is a simple reason that Google posts my site first. 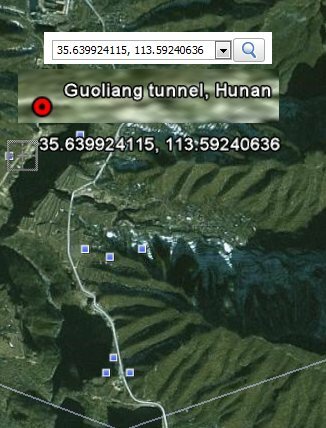 Back in January 2007, I posted the very first web page to thoroughly document the story of the Guoliangcun Tunnel. This meant anyone who typed "Guoliang" into Google came to my page first. The advantage of being the first to publish is that Google keeps directing people to the page which in turn guarantees it remains first. It's the old story of being popular because you are popular. Everyone assumes you must be popular for a reason, so they treat you like you are popular. That means you stay popular. What I didn't bargain on was that this odd phenomenon would make me the worldwide authority on Guoliang, at least where the Western civilization was concerned. Let me tell you something... it was a little embarrassing for me to discover I had accidentally become the worldwide authority on a place I have never even been to. This doubled my resolve to at least get the location right! As I clicked my way down the first and second page of Guoliang listings, I noticed I wasn't the only one who got the location wrong. Lots of websites had Guoliang listed in Hunan Province instead of Henan Province. In fact, I saw so many websites agreeing with my Hunan location that for a moment I began to wonder if I was right and the Korean gentleman was wrong. How could this many websites get it wrong and just one guy get it right? Then I noticed something... there was something very odd about every single web site that agreed with me. They all had the same pictures as my web site. As I looked closer, I realized they had the same words too! That's when I realized that every single one of these websites had copied their material from my website. Thanks to me and a bunch of copycats, each one of these websites had Guoliang situated in Hunan Province, not Henan! I counted a dozen different websites that all incorrectly had Guoliang placed in the Hunan Province! At that point, I stopped looking. I was disgusted to see my own mistake had been magnified many times over. As it stood, for the past two and a half years, the people who had visited my site assumed I knew what I was talking about. I had just proven one of my favorite proverbs: "A computer can allow you to make as many mistakes in two seconds as 20 men working for 20 years." I hope you see the humor in this... I have never visited the place, I didn't take any of the pictures I posted, and everything I wrote was borrowed from something else I had read on the Internet. In other words, I contributed absolutely nothing original of my own whatsoever. I was simply a parrot echoing the words of other writers. Yet now I was the worldwide authority. No satisfaction in that honor, especially when I didn't even know where the place is! This situation bordered on the ludicrous. It would have been funny except that I had misled the entire world as to the correct location. I sat at my computer feeling abashed. My error in placing Guoliang in the wrong Chinese province had been inadvertently multiplied many times over. Thanks to me, the entire Internet was having fits locating this place! In fact, no one even seemed to realize it had been misplaced. Had it not been for Suhan's innocent note, I would have never even known my own mistake. I was responsible for promulgating a stupid mistake across the entire planet! As you will soon read, many people who followed in my footsteps made things even worse. I was unable to find a SINGLE INTERNET WEB PAGE that had the correct location. The entire Internet couldn't find Guoliang! I was embarrassed to see my mistake operating like an Internet virus. Oddly enough, I recalled the Canadian airline attendant who was widely credited with spreading the AIDS virus all over North America back in Seventies. Then I remembered the poor kid in Vera Cruz, Mexico, who was credited with starting the Swine Flu in 2008. Being Patient Zero isn't much fun. Actually I wasn't the true Patient Zero. I didn't make the original mistake on Guoliang. I had copied someone else's mistake without bothering to double-check. That said, I was definitely guilty of spreading the mistake far and wide. My frequently-read story was clearly the major origin of the Internet confusion. My guilt prompted me to do a better job. But it wasn't turning out to be very easy to do. How exactly was a man who lives in Texas was supposed to find some obscure village in a vast and distant country with a language that was completely foreign? So on October 13, 2009, I began the search for the correct location of Guoliang. It was unsettling to see how many people copied my original mistake, but at least I could understand that. As I dug deeper, what I found bizarre was that other people who came after me badly misplaced the true location as well. I couldn't be blamed for those mistakes. But the mystery was growing deeper. Why was the true location Guoliang so difficult to find? 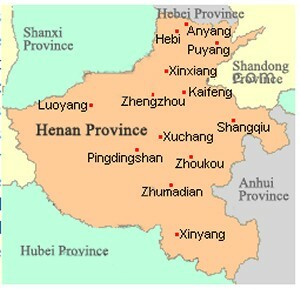 Henan is China's most important province historically. It sits in the eastern part of the country in the central plains region and has the Yellow River running through it, along with sacred mountains and the Shaolin Temple. Henan is the ancient economic, political and cultural center of China. 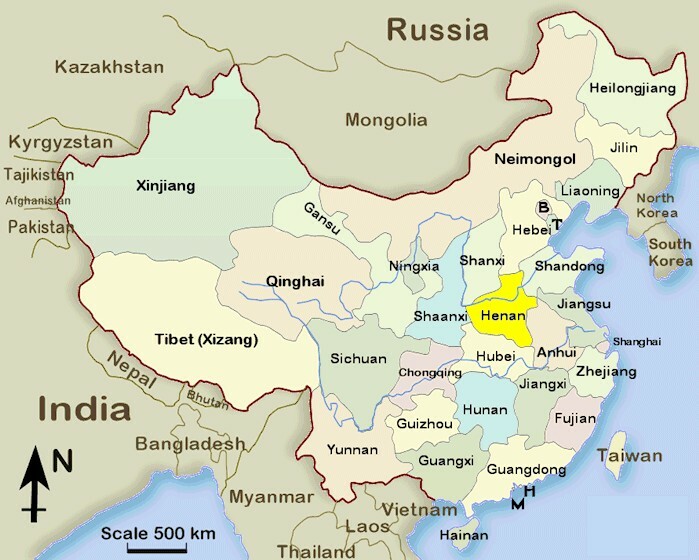 Henan is the crux of China's long-running civilization, being home to scores of emperors over successive dynasties. It features some of the most revered temples in the country. Of its many national parks and scenic areas, Song Shan National Park and the Yellow River are two of the most visited. The province of Henan has several important historical cities, most of which reside in the center of the region. Zhengzhou is the capital and main hub. It is the main rail terminus in China and is just over an hour away from Beijing by plane. Other popular cities are nearby Kaifeng and Xinxiang plus Anyang toward the north. The town of Luoyang is a couple of hours by train or expressway from Zhengzhou. Henan is home to the UNESCO Longmen grottoes and the Ancient Han Tombs Museum and comes with traffic-free streets and a nice look. Laidback Kaifeng is in the other direction from Luoyang. It is an hour to the east of Zhengzhou by expressway and also lies on the Yellow River. One of the most revered places in China is Song Shan (Mount Song). It is between and slightly south of the cities of Zhengzhou and Luoyang are high mountains, Song Shan National Park, and the vaunted Shaolin Temple. There are stupas galore here along with monks practicing kung fu. Gongyi City is also in this general region of Henan and is known for the Imperial Tombs of Northern Song Dynasty. It makes a good daytrip from either Zhengzhou or Luoyang and boasts the restored Yongzhao Tomb. Heading north of the Zhengzhou area is the small village of Guoliangcun amid the stunning Taihang Mountains. 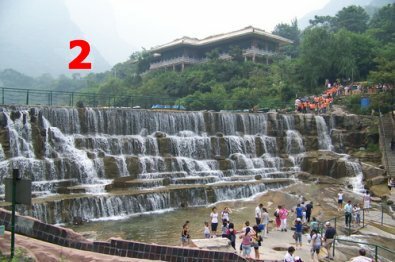 Guoliang has one of the nicest settings of any inhabited region of China with superb hiking and climbing options. The hairy road through the mountains is reason enough for a visit. You are about to read a very strange story. It turns out that our friend Suhan couldn't find Guoliang for a reason - the place is virtually impossible to find even using a powerful tool like the Internet! You will have to read the story to see what I mean. As of 2009, if you type "Guoliangcun" into Google, there are over 2,000 hits listed. If you type in "Guoliang", there are 200,000 hits. Included in these two lists are dozens of blogs and countless pictures that attest to the existence of this little village. 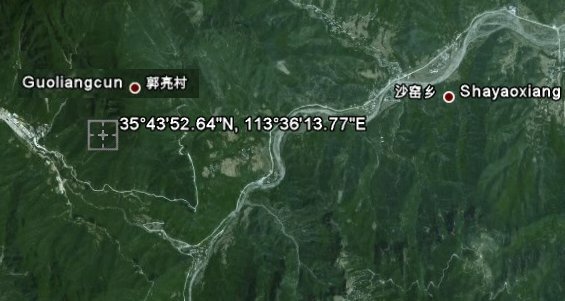 However, after three days of searching in October 2009, I never found a single map or a set of accurate coordinates for Guoliang on the Internet. I am telling the truth. Nor am I exaggerating. As you will see, I documented the entire search in a way that allows anyone to retrace my steps. That said, you shouldn't worry about finding Guoliang if you want to visit. Just go to Xinxiang or Huixian City in Henan Province and tell someone you want to go visit Guoliang. There is not only a bus that goes there, there are plenty of taxi drivers who can find it as well. Considering all the sites on the Internet created by people who have visited Guoliang Village, obviously plenty of people have been able to find their way once they made it to China. 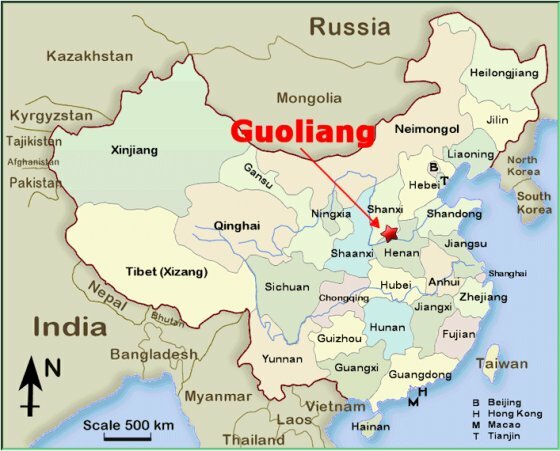 The true location of Guoliang (aka Guoliangcun) is a mystery only to people like me with no access to detailed maps of China. I am sure this data exists on the Internet somewhere, but I couldn't find them. Although I am getting ahead of my story, I came to realize that researching a story in a foreign country is difficult if you don't read their language. So, in a way, my website is popular because it tells the story to the English-speaking people of the world. Of course, please understand that my knowledge is limited. I am sure that some day a person who speaks Chinese as well as English and who has actually BEEN to Guoliang will come along and do a better job. However, until that person emerges, I will have to do. I have written this story for people like me who don't live anywhere near China (there are currently about 5 billion of us in that category) and who would like to know the exact location of Guoliang. For example, I live in Houston, Texas, USA. I am an "Internet Tourist". The Internet is full of people just like me who fulfill many of their travel fantasies by seeing pictures and reading stories about far-flung locations by surfing the Net. My hobby explains the origin of my own 2007 story about Guoliang. I heard about a strange place and was curious enough to learn more about it using the Net. I already had the pictures in an email. Once I realized how little was known about Guoliang, I copied material from a half-dozen blogs and combined it to create an article story about Guoliang. This was a place virtually no one in the Western world had ever heard of. At the time, my article about Guoliang helped generate a lot of interest. I thought I was doing the place a favor. But I never realized I had misplaced it! Of course, the one question everyone asks is "Where in the world is Guoliang?" Good question. When it comes to Guoliang, I have to be honest. This is the craziest place to find I have ever experienced in my life! You will just have to read my story to understand. Before we proceed, I have a suggestion. 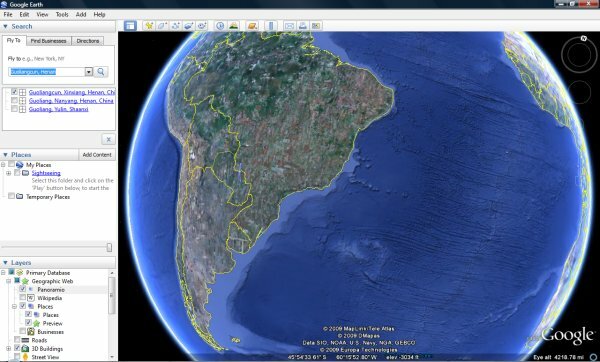 If you don't have "Google Earth" on your computer, then get it NOW. This amazing service is absolutely free! You will have the world at your fingertips. No Internet Tourist is complete without it. All you have to do to acquire this program is type "Google Earth" into Google and follow the instructions. The program downloads quickly and suddenly the whole world is just a few clicks away. Once the Google Earth program is installed, you will swear it is something out of science fiction! The stated goal of the program is to let users "point and zoom to any place on the planet that a person wants to explore". Using satellite imaging, you can go see everything from your own house to the Eiffel Tower, the Pyramids of Egypt, the French Riviera, Dubai's man-made islands known as "The World", Mount Everest, the Grand Canyon, and Jerusalem. Google Earth allows you to check out any place in the world that you have ever been curious about. One of the unique features about Google Earth is the growing inclusion of photographs posted on Google Earth via Panoramio. This feature allows people who have actually visited some of these far-flung places to post snapshots they took of the unique locations. All you have to do is look for the blue boxes and click. Suddenly you get first-hand pictures taken by people who have actually visited the place you are interested in. Each one of those blue boxes represents a picture. For example, this picture of a nature preserve at Guoliangcun was taken by a visitor and posted on Google Earth. Click on any blue square (do you see the examples?) and a picture comes up to look at. It is a wonderful game to visit a place and use the photographs to see what it looks like. (By the way, if you find the pictures annoying, you can also turn them off). Unfortunately, there is a real game to finding these blue box pictures. You have to know where the place is ahead of time to see the pictures. "Close" may count in horseshoes and slow dancing, but you have to be right on the money to find these blue box pictures of your location. Let me see if I can explain. 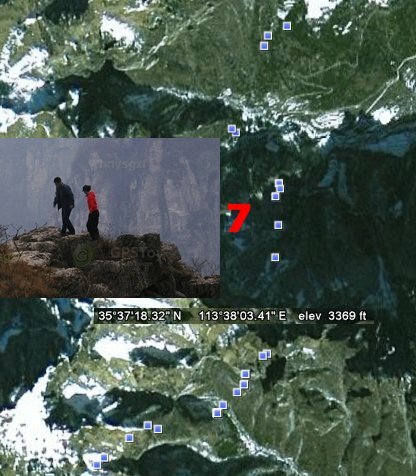 In the "Furthest Away" position on Google Earth, it usually takes a dozen clicks to zoom in close enough for the blue boxes to suddenly appear out of nowhere. By the way, if you haven't downloaded Google Earth yet, go get it! This entire article will be three times more fun if you follow my story on Google Earth. You will be able to go see those blue dots yourself. If you have access to the Internet, you have access to Google Earth. Normally the blue boxes are invisible unless you are at a very close distance. In order to find these pictures by luck, you have to move around a general area, take a guess, then carefully zoom in. Once you hit the exact resolution, out of nowhere, the boxes appear as if by magic. During my search for Guoliang, I can't tell you how many times I zoomed in and out of the Taihang Mountains in China looking for the darn place. However, the neat part of the search is I found myself learning about areas of China that I never knew existed. Although I was always frustrated by my mistakes in locating the elusive Guoliang, I loved roaming around "virtual China" thanks to this remarkable tool. If you really want to enjoy the Search for Guoliang story, I hope you will go download Google Earth. I predict you will have a ball trying to find Guoliang just like I did! Here. I am going to make it easy for you. Click the icon: Google Earth Now go get it! Come back when you have it downloaded. Note: This road is in a difference province than Guoliang. I found this picture by accident as I roamed around China looking for Guoliang. I clicked a blue dot and look what popped up! China has all kinds of cool things to see. For my search, I had three tools - Google, Google Map and Google Earth. I was feeling lucky. So I tried typing "Guoliang coordinates" into Google. So much for feeling lucky. Nothing came up. After some digging around on Google, I did accidentally run across a site that listed the coordinates as part of a photograph. I plugged the coordinates into Google Earth. Although I was directed to China, I found absolutely nothing to indicate I was in the right place. This was just the first dead end in a whole series of blind alleys. When it was all over, I had spent three entire days looking for Guoliang! For my second move, I tried using the search engine for Google Maps. Nothing came up. As you can see for yourself, I struck out on both Guoliangcun and Guoliang as well. Please note I was in the map for Henan Province, but to no avail. For my third move, I started poking around some Internet travel websites that specialize in China. Many of the sites came up empty when I typed in "Guoliang", but one travel website with the name Gecko had a list of 500 places to visit... and Guoliang was one of them. Not only that, it had a map! So I clicked the Gecko link to Guoliang. Unfortunately, every time I clicked, the map directed me to some spot south of Zhengzhou, the capital of Henan Province. That orange "1" is supposed to indicate where Guoliang is. Do you see something that says "Guoliang" in those maps? No, me neither. 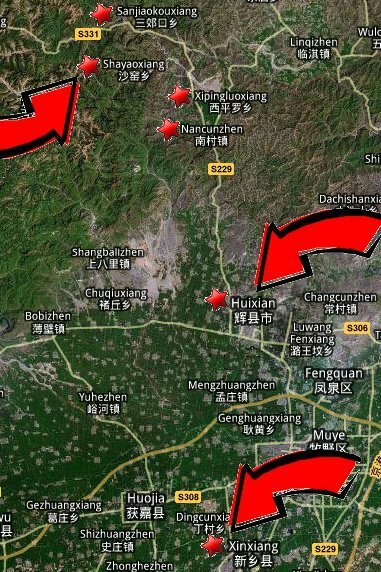 "I'm actually writing this from a town called Xinxiang which is the closest train station to Guoliang..."
Looking at the fourth map above, you can see that Xinxiang is NORTH of Zhengzhou, not South. Something was wrong here. 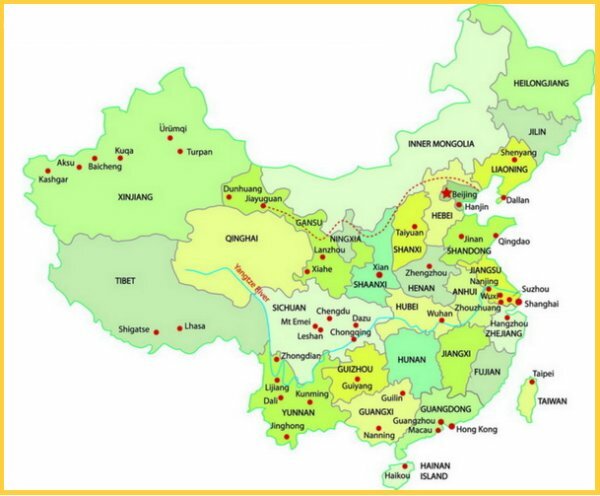 I decided this map could not be trusted for an accurate location of Guoliang. Next I found a description of how to get to Guoliang in a book on "China" by Damien Harper on Google Books. You can reach Guoli�ngcun from Xinxiang, between Any�ng and Zh�ngzhou. Regular trains run to Xinxiang from Any�ng (Y14, 1� hours) or Zh�ngzhou (Y13, one hour); buses also link Xinxiang with Zh�ngzhou (Y24, one hour, every 25 minutes). Exit the Xinxiang train station and take a motor-tricyle (Y2) to the bus stop 1km away for buses to Huixi�n (Y4, 45 minutes, regular). Ask the driver to drop you at the Huixi�n stop for buses to Guoli�ngcun (Y10, 2� hours, depart 8am and 1pm). Note that buses from Huixi�n may have the characters for Guoli�ng on the window, but may (depending on passenger number) only stop at N�np�ng, a village at the base of the road to Guoli�ngcun. From N�np�ng it is a steep 3km walk to Guoli�ngcun up the mountain road, otherwise taxis or local drivers are prone to fleecing (Y40) for the steep haul into the village, especially if travelers are scarce. In the other direction, Huixi�n-bound minibuses (Y10) depart from the bottom of the mountain road from Guoli�ngcun at 9am, noon and 3pm. After studying this description and giving it much thought, I decided I still didn't have a strong idea where to find Guoliang without a map. Guoliang had to be somewhere around Xinxiang. I could find maps with Xinxiang on it. Okay, that's a start, but I still couldn't find a single map that showed exactly where Guoliang was located. Nestled away on its cliff-top perch high up in the Wanxian Mountains in north H�n�n is this delightful high-altitude stone hamlet. For centuries sheltered from the outside world by a combin�ation of sheer inaccessibility and anonymity, Guoli�ngcun shot to fame as the bucolic backdrop to a clutch of Chinese films, which firmly embedded the village in contemporary Chinese mythology. However, I saw several problems. First, the area didn't look mountainous. Second, the location appeared to be in the Shaanxi Province. Third, the location appeared to be about 300 miles from Zhengzhou. Another false alarm. Back to the drawing board. I was getting frustrated. As I studied the map, I decided the Chinese weren't helping very much. In addition to my original Hunan-Henan mistake, my problems with Shaanxi Province (see previous picture) made me notice there was another Province named "Shanxi". Shaanxi-Shanxi. Hmm. Henan - Hunan. Hmm. A closer look revealed Hebei Province and Hubei Province. Hmm. There certainly were a lot of similar names in Chinese geography! They don't make it easy, do they? That's when it dawned on me. Maybe "Guoliang" was a fairly common name in China. That might explain why I kept getting hits on Guoliang that kept taking me to the wrong places. I searched the Internet for a detailed map of Chinese cities. Other than Google Maps which had already turned up empty, I had no luck. A few Internet maps of China listed the major cities, but that was about it. Finding a map listing the Villages was out of the question. I decided that Google Earth gave me my best chance, so I went back to it. I tried simply typing in "Guoliang, Henan". To my surprise, I got an immediate hit (see picture). The problem was, this location was south of Zhengzhou. After studying the location, I determined this might be the same spot the Gecko Chinese Travel Site kept taking me to on my "First Try". Good thing this wasn't baseball. Three strikes and you're out, yes? Guoliang Dead End Number Four - I Discover a Parallel Universe! 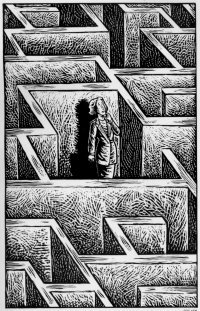 I took another look at the riddle. An Internet site known as The Lonely Planet insisted that after Xinxiang, the bus would take a people to some town named "Huixian". "Exit the Xinxiang train station and take a motor-tricyle (Y2) to the bus stop 1km away for buses to Huixi�n (Y4, 45 minutes, regular). Ask the driver to drop you at the Huixi�n stop for buses to Guoli�ngcun (Y10, 2� hours, depart 8am and 1pm)." I typed "Huixian" into Google Earth and was directed to a new spot for my troubles. (see picture). That cheered me up. I felt like I was getting closer! Then I noticed the directions said that Guoliangcun was still 2 1/2 hours away by bus. So near, yet so far. Then I noticed a curious blue picture box (see picture of blue square with the red square around it). When I clicked the box, a picture of Guoliang appeared. Hmm. I began to wonder if I could find Guoliang by looking at the blue square pictures. So my new strategy was to wander around nearby Huixian and click the every single blue square picture box on Google Earth. This strategy immediately paid off with dividends. I discovered a real nugget! A little further to the west from Huixian, I clicked on a blue box which revealed the picture on the right. Now you tell me - is that Guoliang or not? Of course it is!!! There are windows and a rubble pile and everything. 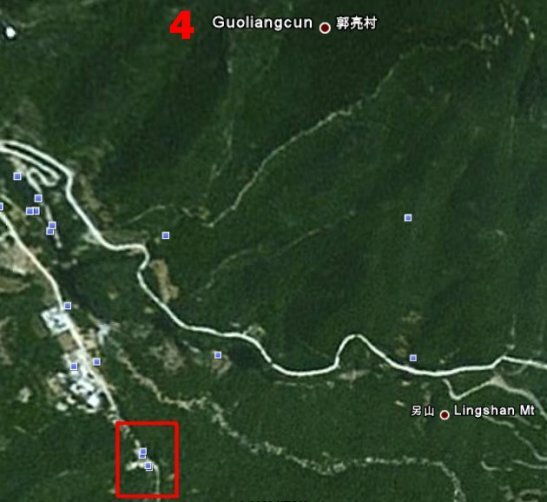 Using Google Earth, I poked around the area for further blue picture boxes of Guoliang or the name of the village. Nothing came up but some place named "Xiyagou". Xiyagou? The more I studied that picture, the more confused I got. To be honest, I had not seen a "Guoliang picture" that matched this new picture. That winding road was new. Was it possible that another community named Xiyagou had done the same thing and carved a tunnel out the mountain? I don't like coincidences. Wherever Guoliang was, it had to be nearby. So I typed "Xiyagou" into Google. I was NOT HAPPY with the results!! As you can see for yourself, there is indeed a parallel universe here. 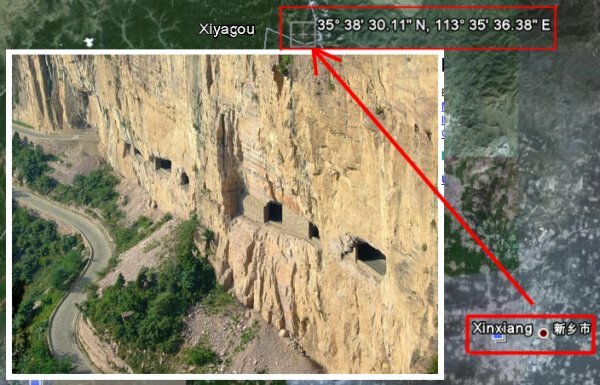 These pictures confirmed that I had accidentally stumbled upon another village in the same mountain region that had carved tunnels out of cliffs just like Guoliang. Since Xiyagou started in the Sixties, I suppose this is where Guoliang got the idea to try the same thing in the Seventies. Good grief! I was getting pretty discouraged. I was finding everything but the place I was looking for! One thing that bothered me greatly was the possibility that Guoliang and Xiyagou were the same place. After all, the pictures of the tunnels sure looked similar and the location was definitely in the same general area where Guoliang was said to be. What was going here? Then I noticed that Xiyagou was listed as being in the Shanxi Province NEXT to Henan Province. I decided that I had simply uncovered an amazing coincidence between two villages that no one else to my knowledge had previously pointed out on the Internet. There must be two different villages with tunnels carved out of the mountainside. This is a picture of a road excavated in the cliff of Taihang Mountain in Pingshun county, Shanxi province, September 2, 2009. 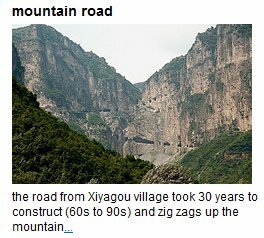 This 1,500-meter (0.93 mile) road took 200 families 30 years to complete and has facilitated movement between Xiyagou village and other villages of the Pingshun county, which has often been obstructed by this mountain range, local media reported. As I read various stories about Guoliang, I noticed most of the bloggers referred to the place as "Guoliangcun". On a whim, I decided to type Guoliangcun, China into Google Earth. Nothing happened. Google Earth didn't budge. So I added "Henan" into the mix. Boom! I got an instant hit! Google Earth rotated swiftly to a town named "Guoliangcun" (see picture). There was only problem... I could not find a single blue "picture" box nearby this spot. In other words, not a single picture existed to indicate I was in the right place. No matter how many times I zoomed in and out, no Google Earth pictures emerged to suggest I was in the right place. For that matter, no Google Earth images appeared at all. This could not be the right place. And yet the blue and red place markers suggested that someone had clearly marked this spot as special. I recalled finding some coordinates on a web site that said he had MARKED Guoliangcun on Google Earth. Maybe this was the place he was referring to. Unfortunately, I think he had the wrong spot. There was literally nothing there. This was driving me crazy!! This had turned into a serious "Where in the World is Carmen San Diego?" quest. Where was the real Guoliang Village? And how could I find it? I had just hit another dead end. I had found four different "Guoliangs". All four had turned out to be the wrong place. I had found a village named Xiyagou that was a near clone of Guoliang and in the same vicinity to boot, but that hadn't panned out either. What was my next move? 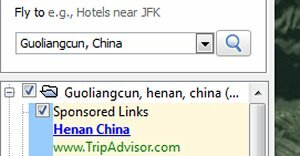 I noticed there was a sponsored link to Henan, China at Trip Advisor. Why not? 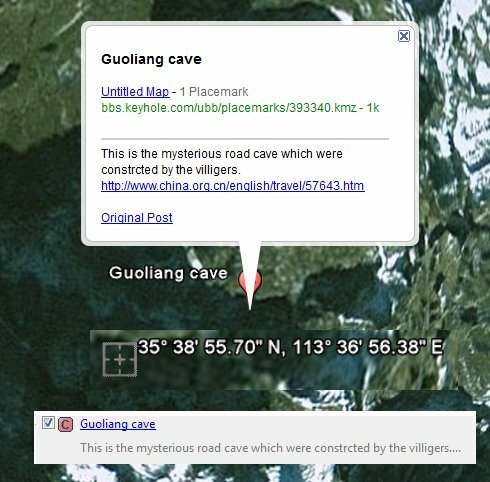 The Trip Advisor link did not reveal the true location of the Guoliang Tunnels. However it did suggest a new place to explore. So I clicked on the link which directed me to The Hidden Village of Guoliang, a marvelous story written by a man named Ernie. I have added excerpts of his story, but to get the full effect, you need to read the whole story at "China Expat" and see the wonderful pictures of Guoliang included in the story. 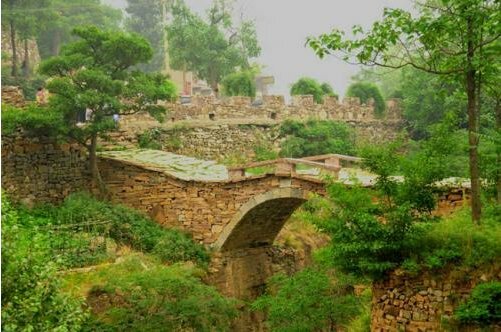 In the heart of Henan's Taihang Mountains lies forgotten Guoliang Cun. Not entirely forgotten, of course, in China a "forgotten" destination can officially mean fewer than ten thousand visitors per day. But far fewer than that disturb this marvelous relic of rough-hewn splendor, and the place truly was forgotten long enough that the term applies more to Guoliang Cun than to most any other Chinese habitation. Yet the key feature of Guolian Cun is its inaccessibility. It sits at a high but by no means vertiginous 1752 meters. Some eighty families comprising 300 odd people give it life. The clue to the hidden nature of Guoliang lies in the fact that almost everyone there shares the surname Shen. In the Yuan Dynasty, the Shen family were powerful officials in Nanjing. But by the beginning of the Ming Dynasty, the Shen's glory had run its course. Emperor Zhuyuanzhang exiled the entire clan to Qinghai, to do hard labor as punishment for some crime real or imagined, but certainly lost to the ages. Somehow, most of the family managed to escape while under guard in Shanxi. Realizing their odds of getting away were greater in small groups, they shattered a giant brass wok, the pieces to serve as symbols of kinship should they or their progeny ever manage to reunite. Thus did the small band and original stock of today's Guoliang Cun intentionally take the most tortuous, untraceable route they could find, stopping only when they stumbled into an all but impenetrable valley. Here they consigned themselves to a world entirely apart from the rest of China. By the 1960s, only one Shen had left to join the army. The rest, never. The fact that less than ten percent of Guoliang has more than ten fingers throws some doubt on the claim (RA note: what does the writer mean by this? ), but a romantic story is a romantic story. And hey, the place is hard to reach, even by China countryside standards. The surest proof of that is the way in, a marvel of manual engineering. A path carved into the side of the valley's east cliff face, a three sided tunnel that would stagger today's average construction firm, is the final stage of the bumpy mountain journey to Guoliang Cun. Actually, there was another way in before, one that scarcely justified being called a path, a goat trail of perilous drops and ninety degree ascents that guaranteed no one left Guoliang valley or went in unless under direst need. 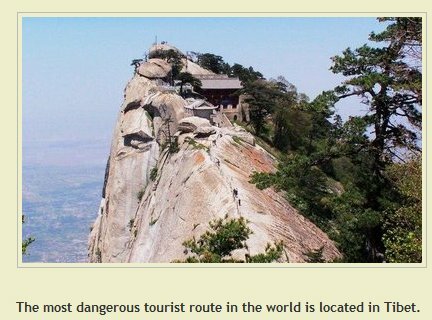 That same "path" today is a draw for a breed of deranged hikers who call a scamper up Hua Shan a "fun day's outing" (RA note: I think the writer is referring to the nearby Mt. Huashan). Not until 1972 did the residents of Guoliang Cun have either the desire or the money to round up a bunch of iron hammers and spikes, a few crude shovels, and get to work carving out the least forbidding cliff surrounding them. 26,000 cubic meters of stone they removed in the project, amazing considering the vertical work site, and the fact that it was hauled out by hand and bundle. Many died during construction of this 1250 meter Cliffside loggia, lending merit to its name Tian Ti, or �Stairway to Heaven' if you like. Just for the heck of it, I went back to Google Earth and decided to close the program to clear the places I had already looked at from memory. When I reopened the program, I simply typed in "Guoliang, China". Look what popped up! Now this looked promising. Except look... there is Hunan back to haunt me again! How weird is that? It is Henan, stupid, Henan!!! Then I remembered that maybe I was responsible for someone making this mistake. Oh. I clicked the first link on the list, the one that simply said "Guoliang". This link took me to Sichuan Province in southern China which was about 600 miles away from Henan Province. Nope, this was definitely not it either. That was the fifth wrong Guoliang I have been directed to. However, there were three links for Guoliang listed above. One of them was certain to be the one I wanted. Let's try the second link! The second link said "Guoliang tunnel". That had to be it! You are not going to believe this. The second link took me back to Xiyagou! I clicked the nearest picture and look what came up! If you recall, Xiyagou was the parallel village to Guoliang that was located in the Shanxi Province (4th Try). In addition, the caption clearly says this place is located in Hunan. Nope, this isn't the right place. This was my biggest disappointment by far. This spot was definitely wrong on two accounts. First, the pictures clearly identified the place as Xiyagou, not Guoliang. Second, it was listed in Hunan Province, but on the map Xiyagou showed up in Shanxi Province. How could someone go to all the trouble of place marking this spot and get it so completely wrong? Paste either coordinate into Google Earth and take a gander. I believe these are the correct coordinates for Xiyagou. The actual tunnel in the mountainside is very close nearby. 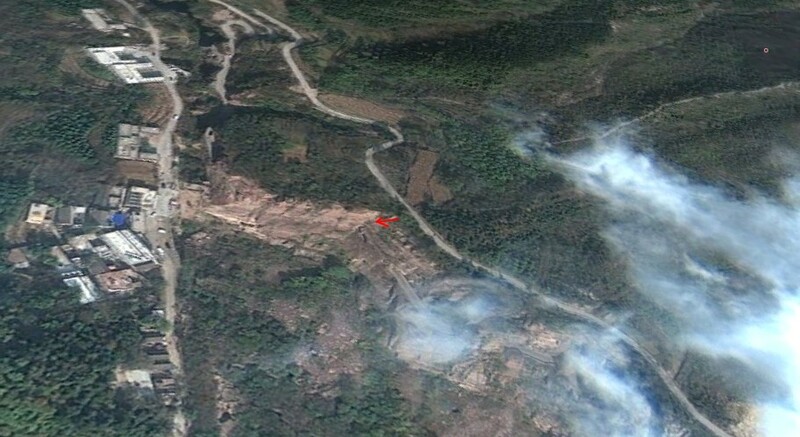 In the meantime, Guoliang Village continued to prove very elusive. Two of the three links have come up empty. Still, there were three links. Maybe the last one will be a home run. Bad news, the third link was another strikeout. This was definitely not the right place either. There was not one single blue picture box in sight. The nearest town was "Mayiti" which was actually fairly close to Xiyagou. Not only was there nothing to look at in the vicinity, the location appeared to be in Hebei Province which was north of Henan Province. Someone sure went to a lot of trouble to mismark our destination. This is the most ridiculous wild goose chase I have ever been on, but something tells me I will find this place yet. How I will succeed I am not sure, but I am not going to give up. For my ninth try, I decided to use a new tactic - brute force. "The village is north of Huixian. It lies up in the Taihang Mountains right on the border of the Henan and Shanxi provinces." Google Earth has a mysterious white line. 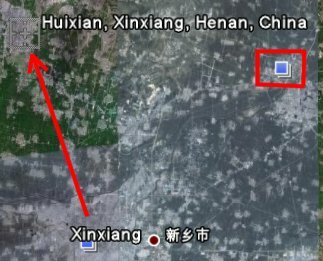 After comparing it to the maps, I decided the white line clearly marked the border between the Henan and Shanxi provinces. There were two major lakes I used as landmarks. Both lakes turned out to be major reservoirs, Mt Kanao in the south, Sanjiaokou in the north. I decided to scan along the white borderline and see what I came up with. The picture seems to indicate a vast distance, but the two bodies of water are only 16 miles apart. Nevertheless, 16 miles is vast using Google Earth. I began a concentrated search pattern within the suspected area. For hours I carefully zoomed in and out the entire area between the two reservoirs looking for clusters of blue picture dots. I zoomed out to get the big picture. Then I zoomed in to look for village names and blue dot pictures. There were hundreds of mountains and valleys to choose from in my Taihang Mountain Range search area. I constantly had to guess which area to zoom in on. Which valley might have Guoliang hiding in it? Or what mountain cliff might contain the tunnel? Here is a simple example. Take the picture on the right. From Google Earth "Big Picture", I had to zoom in 13 times to get a closeup of Reservoir on the right. 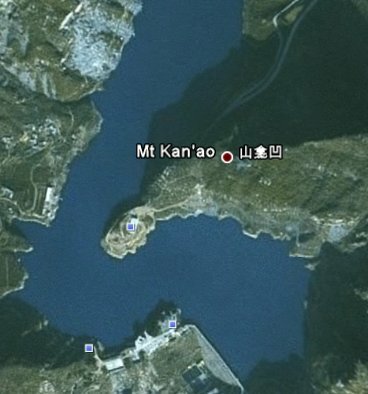 Note that both a caption - Mt Kanao - and a blue dot appeared. I would zoom to get captions, then zoom out to get the big picture. This process took about 5 hours spread out over two days. 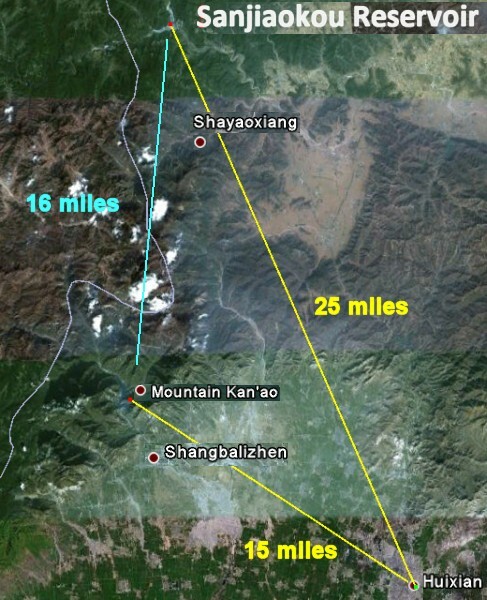 The distance from Sanjiaokou to the Mt. Kanao was only 16 miles, but it felt like I was looking for a needle in a haystack. Unfortunately I had tried all my search engines. It was brute force or nothing at all. Typically, all I saw was the "Big Picture" like what you see on the right here. Lots of green mountains plus the helpful mysterious white line that I assumed was the Henan/Shanxi Province borderline. As I scanned, the names of the villages and blue dots were usually invisible. The only way to see the blue dots and the village names was to stop and zoom in. It usually required zooming in 13 times before the names and dots appeared. It was a crude and imprecise search technique, but I was convinced that Guoliang would be surrounded by several tell-tale blue dot picture squares if I could just zoom in on the right spot. Slowly but surely, my "zoom in - zoom out" method began to produce clues. It took an entire day of searching, but I eventually identified seven possible blue dot clusters. I named it Area 1. As you can see, there were seven blue dots. I opened up the pictures. Area 1 turned out to be a lovely waterfall area. Area 2 was just north of Mt Kanao Reservoir. It turned out to be another lovely waterfall area, but with a much different look. These blue dots revealed many wonderful pictures. The dot cluster in Area 3 turned out to be our old friend Xiyagou. Note that all the dots in the picture on the right were north of the border... Xiyagou was in Shanxi Province, not Henan. Area 7 was promising. I noticed a large cluster of 15 blue dots along a line. Alas, when I opened them, I discovered the pictures were taken by a group that was hiking across the Taihang Mountains. Boy, I bet that was a fun trip. These mountains have some really beautiful scenery. I enjoyed looking at the pictures immensely. Even though it probably seems like I was on a wild goose chase, I freely admit I had the time of my life exploring this remote area of the world using Google Earth. I felt like I was on an adventure of sorts. Viewing those Panoramio photos made all the difference in the world. These snapshots allowed me to get an idea of this exotic part of the world I was visiting. Not once did I feel like I was wasting my time. If I had one regret, it is that all the captions on the photographs were written in Chinese. Maybe if I could have read what they said, I could have gotten some earlier clues to help me find our missing Guoliang. Oh well, can't have everything! At Area 6, I found two mysterious dots. Both dots revealed pictures that appeared to be Guoliang. However, after zooming in and out, I couldn't find any mention of Guoliang. There was not one village that popped up. The pictures were just randomly placed in the middle of nowhere. However, finding those dots was encouraging. It made me think I was on the right track using this brute force method. Surely Guoliang had to around here somewhere. Area 5 broke my heart. I couldn't find what I was looking for between the original two lakes. So I drifted 5 miles north of the upper lake, the one that turned out to be Sanjiaokou Reservoir. I saw a single blue dot.  When I clicked it, the single dot turned into three dots. All three blue dots turned out to pictures of Guoliang! 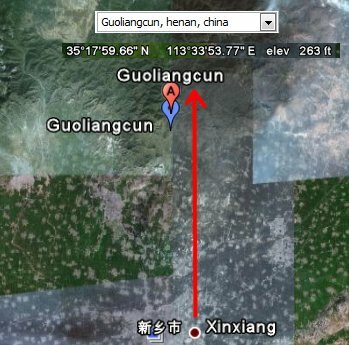 There was just one problem - similar to Area 6, there was not a single village named "Guoliang" in the area. I only saw 'Majiaquan', but nothing else. Area 5 marked the fourth time I had found random Guoliang pictures. Rather than be discouraged, I was more convinced than ever the correct location had to be in one of these valleys. I knew if I just kept exploring, I would find it eventually. The problem is that my cursor had to be directly over an area when I zoomed in for the blue dots to appear. This was slow going. I moved into my third hour of looking. I finally find Guoliang on Attempt Number Ten! I eventually gave up on the area north of Sanjiaokou Reservoir. Moving back south, I saw a valley and zoomed in. I saw a cluster of blue dots I had not noticed before. As I zoomed in, out of nowhere the word Guoliangcun jumped up. OMG! I immediately clicked the Blue Dots in the Red Box. Look at the three pictures below. Every one of them was a picture of Guoliang! But I had seen pictures of Guoliang before. What made this different was the name of the village had popped up as well. This was definitely the right place. My search was over. I had finally found the real Guoliangcun. If you enter these coordinates into Google Earth, it will take you straight there. 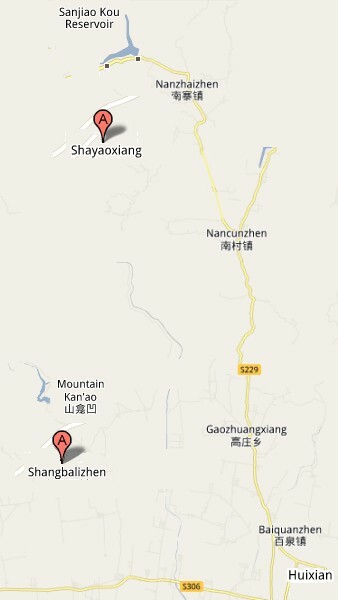 By the way, take note of the village in the map named Shayaoxiang. It is the largest village near Guoliang. 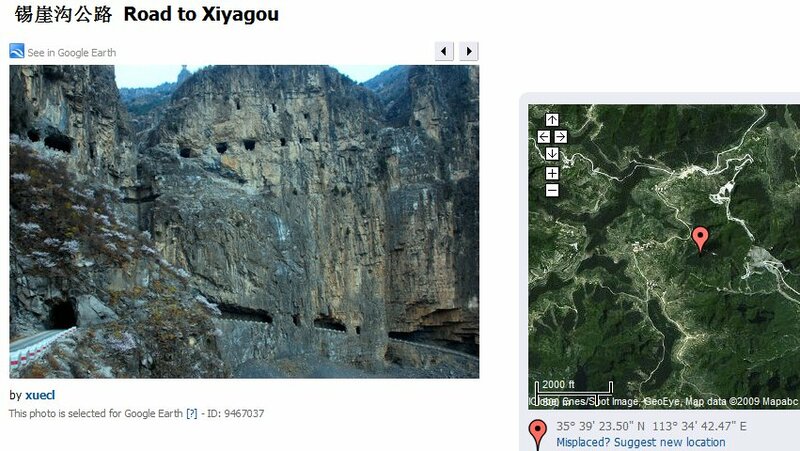 It appears on several maps of China, including this Maplandia photo on the right. 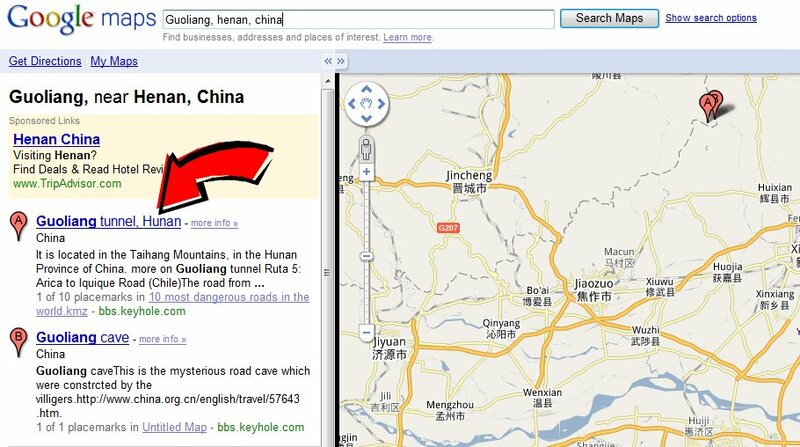 Just for fun, I typed "Shayaoxiang, Henan, China" into Google Maps. I was amazed to see the screen take me straight to the right place. Then I looked around. Guess what I found just down the road from Shayaoxiang? There is Guoliang! Guoliang is less than a mile from the Henan-Shanxi border. It is nested on the rim of a cliff. Down in the valley below, a gentle stream connects to an unnamed river that flows east through Shayaoxiang. If you can get in a helicopter, the Sanjiaokou Reservoir is only 6 miles to the northeast. 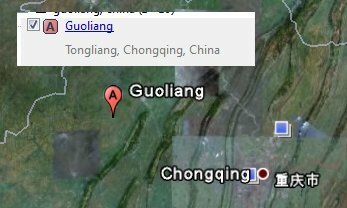 The good news is that iyou can actually find "Guoliang" yourself on Google Maps. Just type in "Shayaoxiang, henan, china" and watch it go to work. 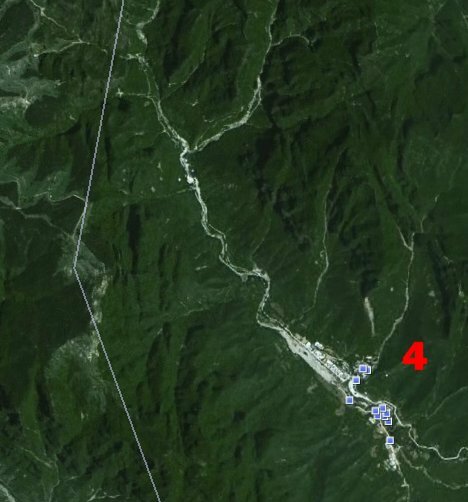 On this map Point A is none other than our old friend Xiyagou (A), the village with a different mountain tunnel. To refresh your memory, Xiyagou was the dead end on my 4th try. Gouliang (B) nearby just on the other side of the Shanxi Province Henan Province borderline. Although Guoliang and Xiyagou with their matching tunnels are in different provinces, I later discovered that they are actually only 6 miles apart!! 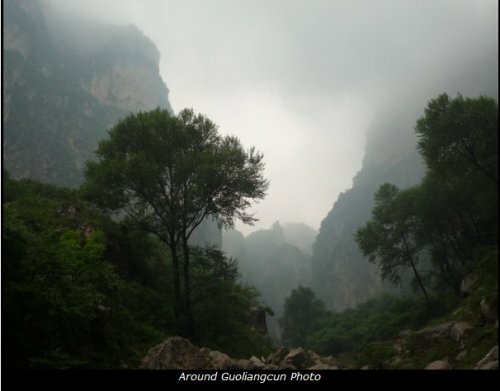 In June 2011, I took another look at Guoliang. I noticed that Google Earth had added a 'three-dimensional' feature. I believe I was able to spot the sheer cliff. Look for the small red arrow. I believe that is the spot where the road suddenly disappears into the tunnel. It also looks like there is a very modern road up at the top. From some of the more recent pictures I have seen, Guoliang seems to be growing into popularity. It couldn't happen to a neater place. I noticed that Google Maps still doesn't lock in "Guoliang" like it should, but if you type "Shayaoxiang" you shouldn't have any trouble finding it. I now am fairly certain the distance between Huixian and Guoliang is 27 miles, but I cannot imagine any tour bus negotiating those steep hills and twisty roads in less than an hour and a half. The distance from the Henan Province capital Zengzhou to Guoliang is 100 miles. It was very difficult to locate this place originally since I can't read Chinese, but I can't imagine having any trouble finding Guoliang once you are in China. Nevertheless I have some maps that you are welcome to download. During my three day search for the real Guoliangcun, I created several maps similar to the one above to help me get oriented (small joke). In addition, I collected a vast amount of additional information about Guoliang you will certainly find interesting. One thing I find very amusing is that Guoliang appears to have gained a "Film and Television" department which appears on updated maps. I have a hunch pretty soon the world won't need me anymore to find this place. At this point, I am so certain of the location of Guoliang, I honestly believe I could rent a car and drive there myself. If you are planning on visiting Guoliang, you will probably find the maps I have provided very useful. These maps are so accurate, I bet you could drive there too!